So reads the famous last will of Sun Yat-sen, reprinted in his original calligraphy on the back cover of the Schiller Institute’s newly released re-publication of Sun’s 1917 Chinese-language booklet, The Vital Problem of China. The 1997 republication of this work was timed to coincide with the celebration of the 130th year of Sun Yat-sen’s birth. The book was written soon after the United States had been drawn into the First World War, and the British Empire was manipulating China into joining the war on the side of the allies. In protest to this decision, Dr. Sun Yat-sen wrote The Vital Problem of China, which today stands as one of the most stunning and insightful indictments of the British Imperial policy of “Balance of Power” politics and the global disasters that result from it. The book’s publisher, the International Schiller Institute, named after the famous 18th century “Poet of Freedom” Friedrich Schiller, was founded in 1984 by Mrs. Helga Zepp-LaRouche and has chapters in over 60 nations around the world today. In a recent press conference in New York, Mrs. Zepp-LaRouche elaborated on the Schiller Institute’s timely republication of this book. She explained that the current state of the western financial system was like a gigantic bubble consisting of trillions of dollars of speculative financial paper, which was in danger of bursting at any moment, thus causing major political and social catastrophes worldwide. According to Mrs. Zepp-LaRouche, the only solution to this crisis lies in realizing the great dream of Dr. Sun Yat Sen (thoroughly laid out in his National Reconstruction of China) to integrate a modernized, industrial China with the rest of the Eurasian continent through the construction of the so-called Eurasian Landbridge, or the “new silk road.” Today, this “new silk road” consists of three major cross-continental railroad “development corridors” which would integrate the two great economic and cultural centers of the planet, Asia and Europe, as well as massively develop the resource-rich central Asian areas between them. Mrs. Zepp-LaRouche also explained that this method of physical economic development of infrastructure as the basis of economy was what was used by the American leaders like Alexander Hamilton and Abraham Lincoln to develop the United States into the most powerful industrial economy in the world. The building of the Eurasian Landbridge could thus serve as a “locomotive” for a world economic recovery program, providing a peaceful and prosperous solution to the crisis for all. 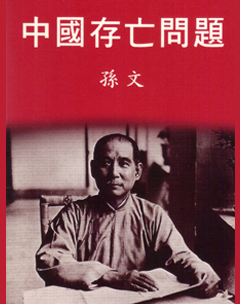 The Vital Problem of China was written by Dr. Sun as the answer to the capitulation by the Chinese government to the British demand that China join the war against Germany. He favored neutrality for China, and, if she must join the war at all, than certainly it should be on the side of Germany against the British dominated alliance. Dr. Sun demonstrates an exceptional insight into the British manipulations which had led to World War I, as well as the perfidy of the concept of ‘balance of power’, and his essay is surely one of the most devastating analysis of British policy as it existed then, or as it is now. It is no surprise that the British regarded Dr. Sun as highly dangerous and missed no opportunity to plot against him; not only because he discovered the evil of the method of their ruse, but also because his program for the infrastructure development of Eurasia would have meant the end of their British ‘Empire’ and colonialism. Just as then, when the British answer to this was their ‘geopolitics’, so today, the British-dominated oligarchy is involved in the destabilization of especially Russia, as well as Central and South Asia, in an effort to sabotage the realization of the Eurasian landbridge. In hopes of convincing the Chinese government to reverse their disastrous decision to declare war on Germany, Sun focuses on the results of the 1815 Congress and Vienna and Britain’s East India Company policy of colonialism, and demonstrates that the alliance against Germany was the result of ten years of strenuous efforts on the part of the British. According to Sun, the key to Britain’s continued world power was India, and its policy toward Europe was premised on guaranteeing that no nation could become strong enough to threaten her control over this “Jewel in the Crown” of the Empire. This meant maintaining British control over the seas, and the control of the route to India via Egypt and the Red Sea. Thus, according to Sun, joining Britain in the war on Germany could only be viewed in the context of the sordid history of both Anglo-Sino relations, as well as the history of British foreign policy in general. Every year England takes large quantities of foodstuffs for her own consumption from India, where in the last ten years 19 million people have died of starvation. It must not be imagined for a moment that India is suffering from underproduction. The fact is that what India has produced for herself has been wrested away by England. Is that any better than submarine warfare? Nominally, of course, the British are not plundering, but in fact, the exorbitant taxation and tyrannical rule in India are such as to make it impossible for the natives to maintain their livelihood; it is nothing but plunder on a grand scale. Is it right for England to rob China of Hong Kong and Burma, to force our people to buy and smoke opium and to work out portions of Chinese territory as her sphere of influence? … If one really wants to champion the cause of justice today, one should first declare war on England, France, and Russia, not Germany and Austria. But … China does not want to declare war on either side. As is well acknowledged today, the postwar Versailles Conference was a disaster for China. Here, too, Sun accurately predicted this exact outcome if China were to join on Britain’s side in the war. He tells the story of the Treaty of Vienna, where Britain was rewarded for helping to defeat Napoleon by taking the Cape of Good Hope and Ceylon, both previously Dutch colonies. Similarly says Sun, would Britain treat China. Indeed, at Versailles, the Powers turned Germany’s interests in China over to Japan, even though China was one of the “Allies”! Whether the Allies win or not, says Sun, China will be Britain’s victim. The existing Chinese Government is worried about its financial situation, not knowing that financial resources are dependent on the national economy.. The foreign policy of any country should be determined according to the permanent interests of the country, not according to the feelings and emotions prevailing at the moment. The above brief examples of the rich insights of Sun Yat-sen’s 1917 The Vital Problem of China provide a mere glimpse of the great value of this work and its critical relevance in the world today. If China today is to carry out the historic mission of leading world economic development by means of Dr. Sun’s dream of a modernized China and the Eurasian Landbridge, it is critical for all to have a complete and accurate understanding of the historic and political context in which this occurs in the world. In the 18th and 19th centuries, the United States of America was the world’s advocate of real economic development and the freedom of all nations from colonialism and exploitation. But by 1917, America, once the archenemy of the British Empire, had capitulated to London, thus temporarily abandoning China and her other natural allies. Today, however, it seems that more and more Americans, perhaps newly inspired by a revived spirit of Sun Yat-sen among Chinese people, have well learned the disastrous consequences of that historic mistake; that once again America may be ready to reinstate its natural world alliance of a United States of Lincoln with a China of Sun Yat-sen. Certainly, American participation in the building of the Eurasian Landbridge, very much modeled on Lincoln’s idea of the American cross-continental railroad, points in this direction. …..The modern history of China is a history of humiliation and shame. This booklet written by the father of our nation declares clearly to us: Existence or perishability of a country lies in the unyielding consciousness of its government and its people. Our Chinese nation stands with heroic posture in East Asia and has experienced 5 thousand years without becoming so feeble as to die. The reason is that the descendants of Emperors Yan and Huang inherited the culture of the Doctrine of Mean, which gradually progressed from the image of Taichi: takes love as cardinal foundation; take heaven and earth as the foothold of our soul; and be particular about good faith, self-cultivation and concord. The other reason is good intentions towards all others. Bring all the various nations under heaven into harmony, to work together in mutual confidence in a Great Commonwealth that shares wealth and woe. Therefore the world may map out of its own accord without mishap for eternity, and attain a realm of heaven on earth as well blended as milk and water.